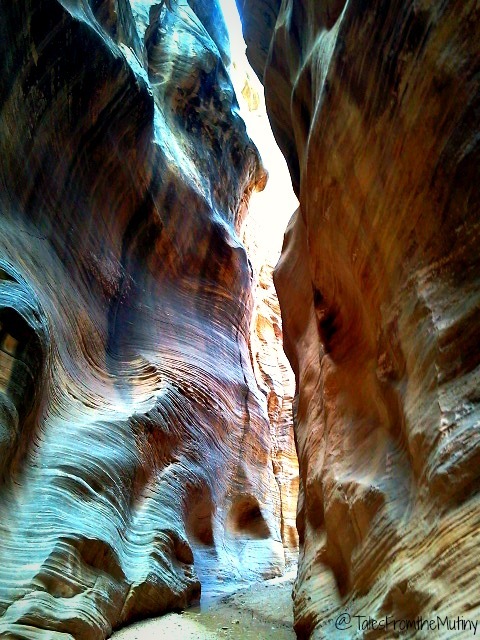 Your’s truly down inside Bull Valley Gorge. We’d waited a looooong time to finally visit Kodachrome Basin State Park. 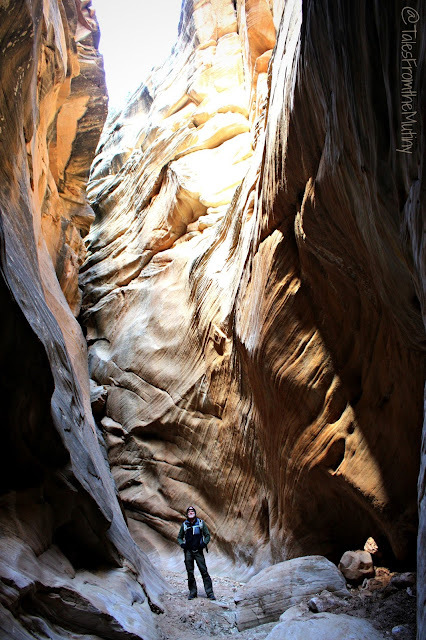 Every since Nealy’s on Wheels blogged about it back in May of 2014 it had been on our radar and, after reading about a couple of nearby hikes in our recently acquired guide book Favorite Hikes In & Around Zion National Park by Tanya Milligan and Bo Beck, we were super stoked to have arrived. The Mutiny at Kodachrome Basin State Park. Kodachrome was named in 1949 after a National Geographic team came out and photographed the amazing colors on their equally amazing (and brand new) Kodak film…some of you reading may remember film, right? 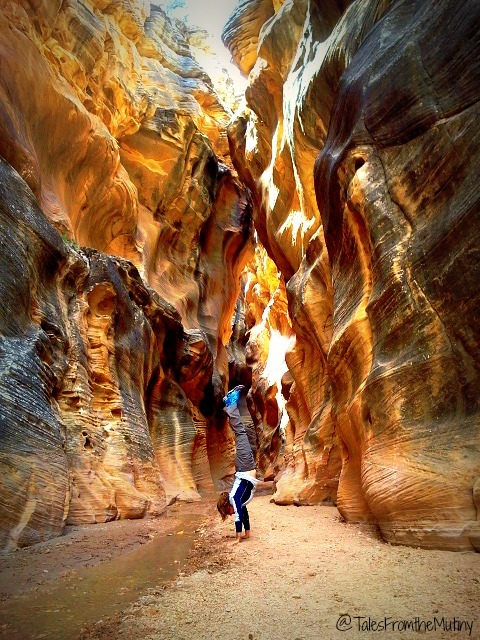 Dotted with towering sandstone spires, you can be sure that this park is pretty extraordinary. Full hookup sites will set you back $28 per night while dry camping is $19 per night. 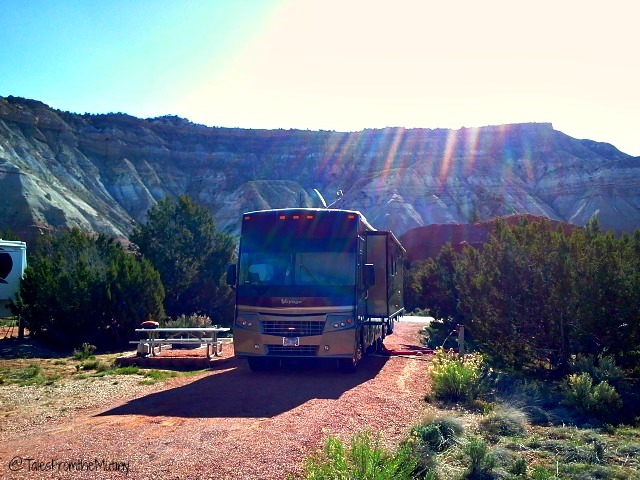 Due to it’s close proximity to Grand Staricase-Escalante there are also boondocking options on BLM land but, you do need a permit. (Be sure to stop at the Cannonville Visitor Center before making the drive out to find a campsite in Grande Staircase). Although Kodachrome offers several hiking options right in the park we were there for something else…two slot canyon hikes in Grand Staircase. 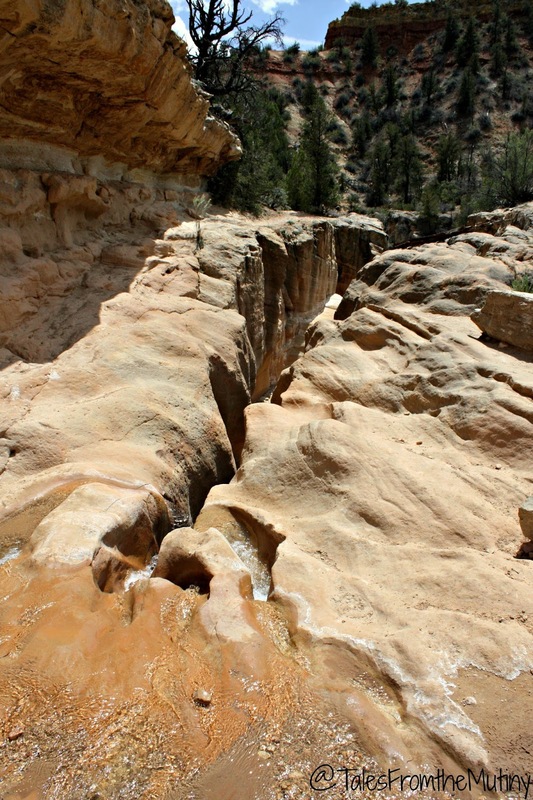 These two hikes are our all-time favorites of all that we did in the entirety of this region. 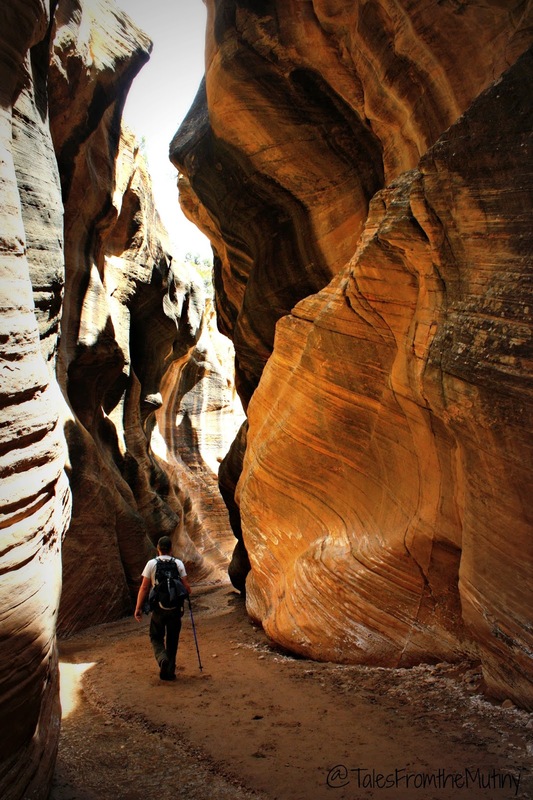 Now, I know it may seem confusing because we’d hike a slot a few weeks earlier in Grand Staircase (before we even got to Zion) but remember, at 1.9 million square miles, Grand Staircase is huge. So, some parts are easier to access from Big Water, or Kanab, or Kodachrome (Henrieville, UT), or Escalante and even from Capital Reef National Park. Skutumpah Road…fairly well maintained at this point (any car could drive it) but conditions change fast. Rain makes it slick as snot and impossible to drive on (seriously, don’t even try). 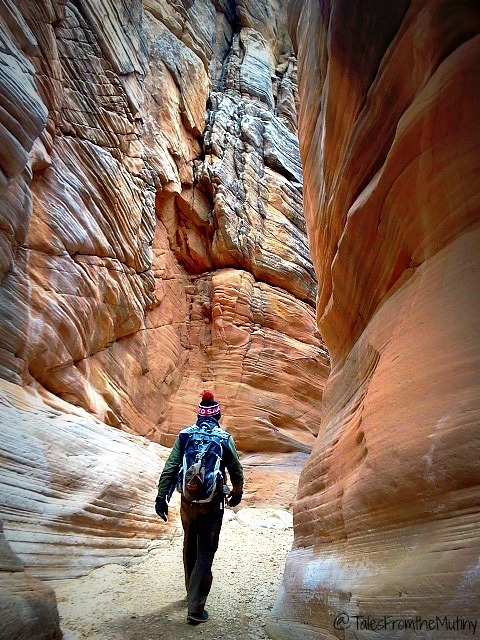 Disclaimer: We aren’t experts about hiking, climbing or canyoneering, all of which can be dangerous activities. It’s imperative that you understand your own capabilities (be honest) and obtain the most current information about the trails you want to hike and the roads you’ll need to drive to get there. Always, always, always be aware of trail and weather conditions. Skutumpah Road is impassible once it starts raining and it’s highly unlikely you’ll get cell signal in this area…and even if you do, we heard the BLM ranger warn a hiker that they will not send anyone out to rescue them until the roads are safe to do so. We advise everyone to check in at the ranger station for information on all trails and impending weather…the sun may be shining when you set out on the trail but even if it rains several miles away it can cause flash flooding throughout the region. 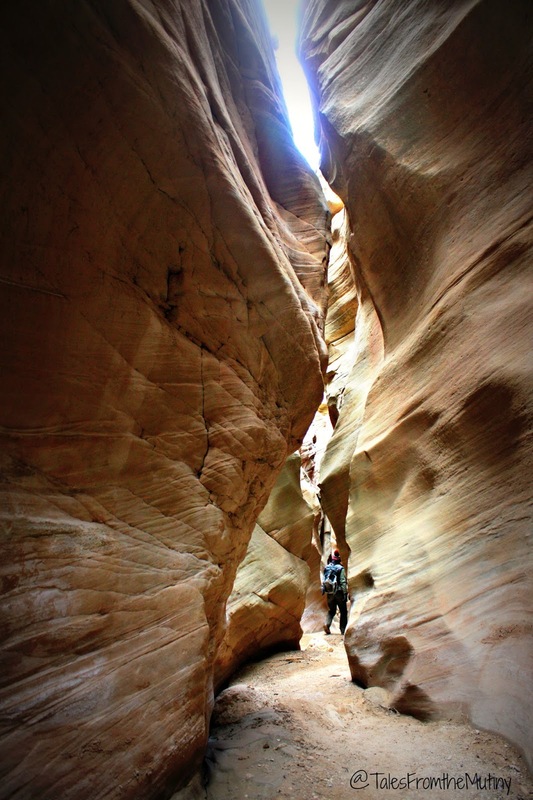 According to our hiking guide (see link above) Willis Creek–>Sheep Creek–>Bull Valley Gorge is a 17 miles loop…perfect for a very long day (10 hours) or an overnighter (there are tent camp site recommendations in the book). 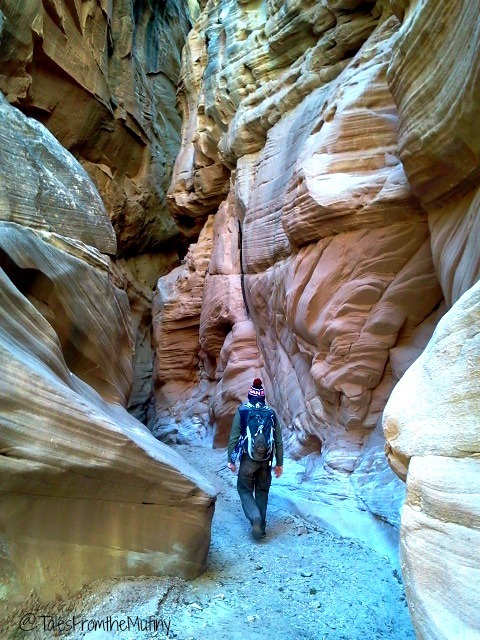 However, we decided to tackle Willis Creek as 4-5 mile out & back trail. From Kodachrome once you exit the park make a right on the main road (toward Cannonville and Hwy 12) and then a left onto Skutumpah Road. 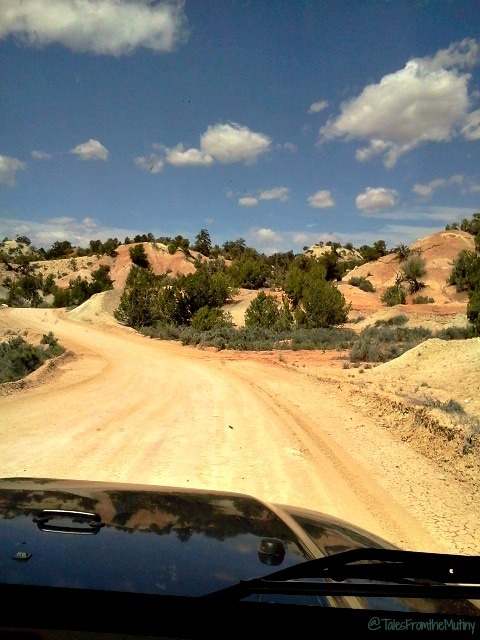 This is a dirt road but should be in good enough condition even for passenger vehicles. 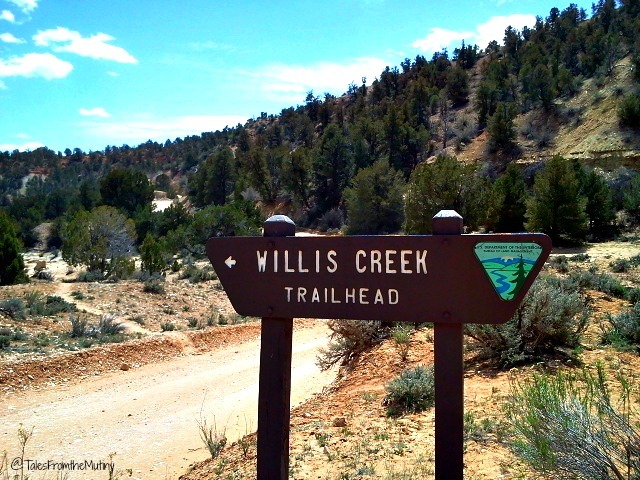 Travel about 5.5 SW on this road you’ll find a parking area and the trail head for Willis Creek. 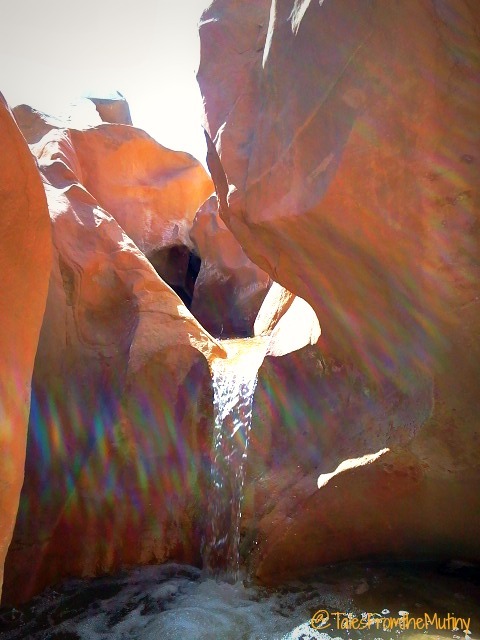 Here’s where the creek cuts into the rock…it’s a baby slot! Come back in a million years and it will be hikable! The other side of the above picture…the funny little waterfall. At the trail head just look for the creek and head downstream. You’ll find a funny little waterfall (the creek runs year round) and the start of the narrows, which goes on for about 2.5 miles. They walls continue to get higher and there are some nice, very narrow sections along with plenty of great photo ops. 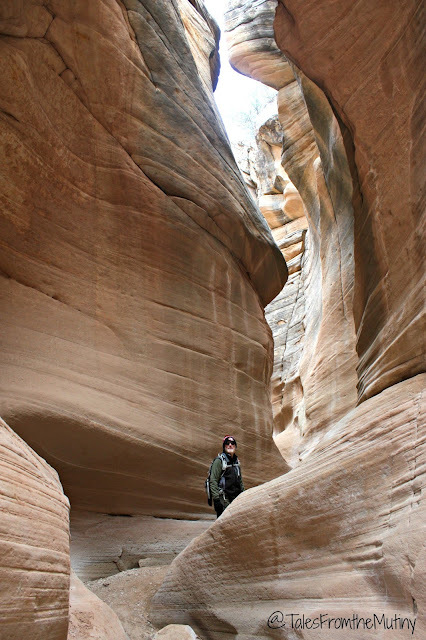 Once the canyon walls widen and the trails broadens into a deep, sandy wash you can turn around (unless you’re making the long loop). 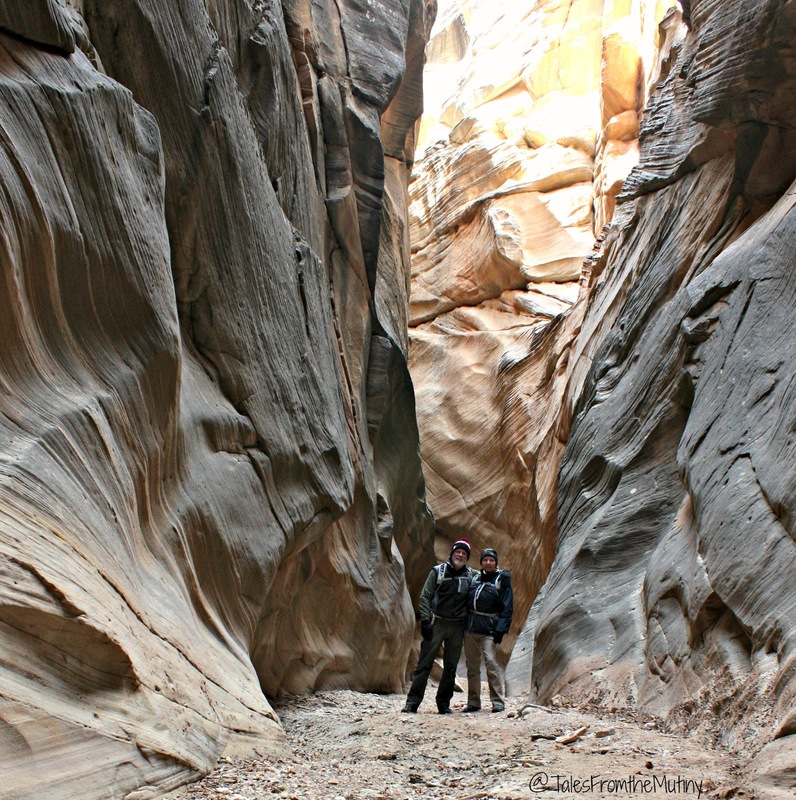 This is a fairly popular hike because it’s easy and non-technical so everyone in the family can experience the slots even if they can’t hike very far (simply turn around at any point). Because the creek runs year round be prepared for wet and/or muddy conditions. At the time of our hike the water flow was low but left over snow melt made for some slick, muddy sections. We saw maybe 6 people during our entire hike. For further details on this hike click here. 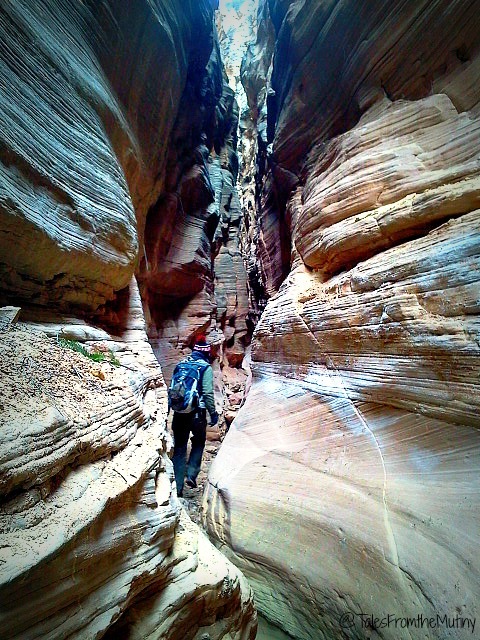 Bull Valley Gorge was the most impressive slot we hiked. While not quite as easy of a stroll like Willis Creek, during our hike the conditions of the slot did not require any equipment and not much technical skill (there was some climbing but tree trunks and large boulders made each drop accessible for us). Just remember, trail conditions change every season and after each rain (or snow) which is why we recommend you check with the ranger before heading out to these slots. Also, for all of the dryfalls and boulders you will potentially have to climb down and over you will have to climb back over or up them to get out. So, be honest with your abilities (and be sure you can climb back out) before you commit to going any further. For details on this slot click here. Near the start of the slots where the walls are low and let in a lot more light. 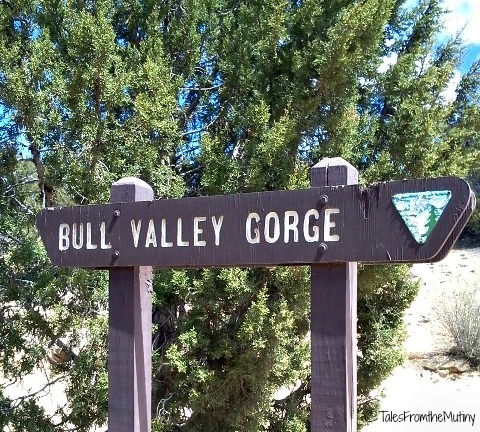 The trail head for Bull Valley is just a couple of miles past Willis Creek. You’ll cross a small bridge, which you’ll actually be hiking under, so find a parking spot shortly past the bridge. Walk back over the bridge. You’ll hike up-canyon, on the right side of the slot (the gorge on your left) and should cross a registration box rather quickly. Hike about a mile or so along the ridge. 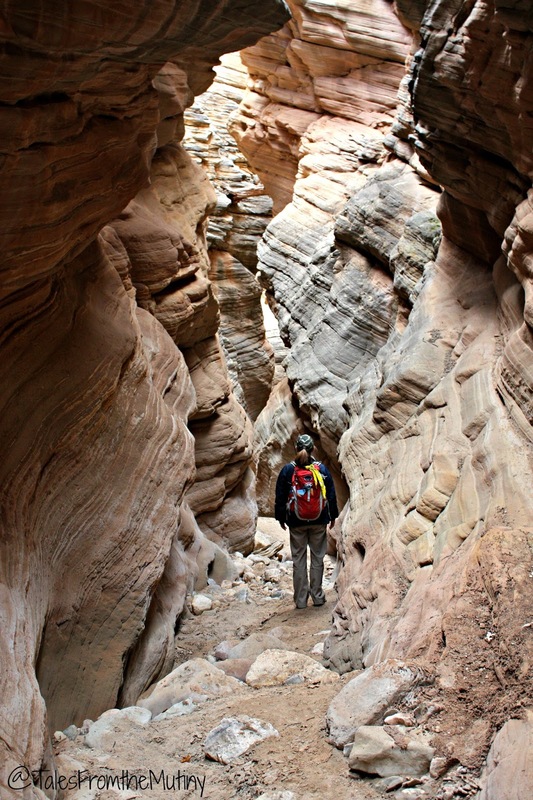 You’ll be tempted to drop down into the canyon at several points but don’t do it…hike up canyon until you can basically step into it so you don’t miss all the spectacularness. 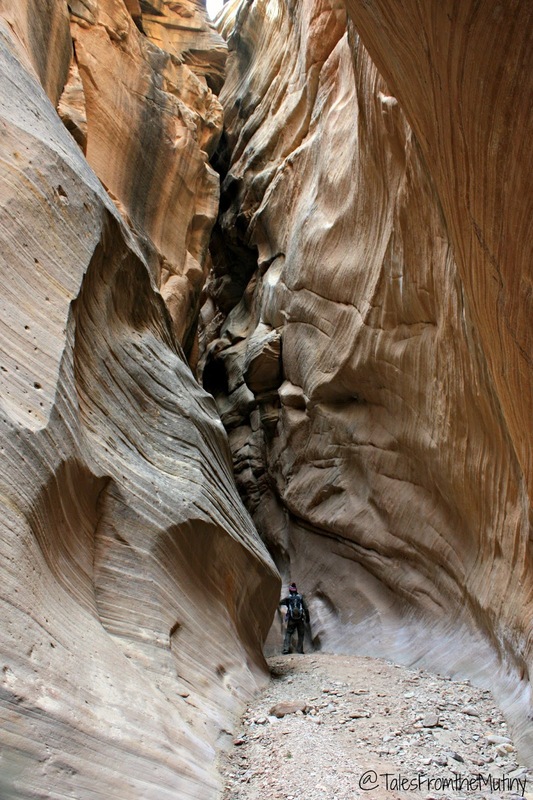 Once you drop down you’ll start hiking down canyon and the walls will grow taller and taller. FWIW, we only saw one other couple during the several hours we were in this slot. The truck…the walls are so high here that I was unable to get the slot floor in the shot. Soon you’ll get to the bridge (the one you drove across to park). 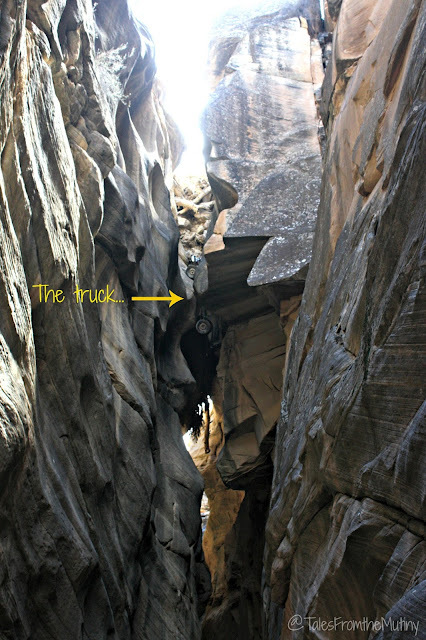 Look up and spot the 1954 Pickup wedged in the canyon. The story is that the pickup slid off of the old wooden bridge that once spanned the narrows killing the 3 men inside. The bodies were recovered but the truck was left in place. Dirt, boulders and trees were shoved into the crevasse to widen the road. I’m not gonna lie, it was a little eerie walking underneath that truck. 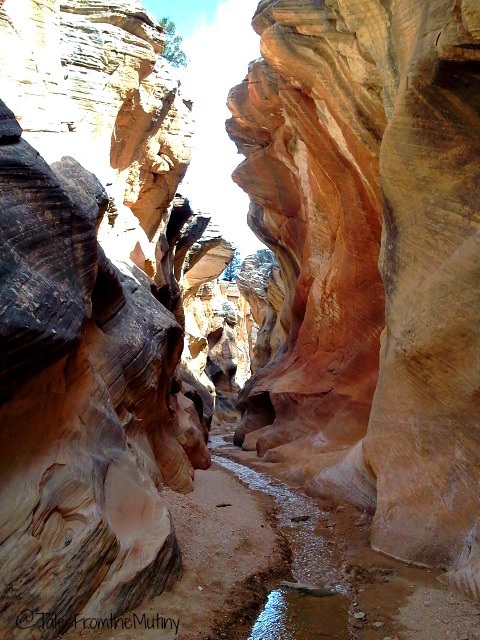 The narrows go on for about 2 miles. Once you’re done exploring simply turn around and retrace your steps back to your vehicle. These two slots certainly made up for any lingering disappointment we might have had for “missing out on” Antelope Canyon and Zion. To this date, they are among our most memorable adventures in our 3 1/2 years on the road. If and when we “settle down” one of our top priorities will be to live near enough to Southern Utah so we can visit often. We feel the same way about southern Utah. We have spent two to three months in the area the last three years. We are leaning towards Moab as a more permanent place.